Data Consolidation for Excel is an Excel add-in which allows to consolidate spreadsheet data from one or several sheets from one or many open workbooks quickly and easily. Data Consolidator - This useful tool makes easy the process of consolidating information proceeding from a different workbook but from the same range. Consolidator (Creating models) - This utility is contained within the Consolidator tool. It is useful for the need to often create and execute the same model; in other words, the same model with the same data. The consolidation tool allows to save those models and simply execute them the next time required. Consolidator (Existing Models) - After a model has been saved, it can be executed using this tool. Consolidator (Copy models) - Enables to copy consolidation models from a workbook to another. For this objective, the workbooks that contain the consolidation models must to be open. Multi-Sheet Consolidator - This tool copies the selected sheets from each chosen workbook to a existing workbook or to a new workbook. Afterward, it consolidates the same range from each sheet in a new sheet (in the case of a new workbook) or in the selected sheet (in the case of a open workbook). 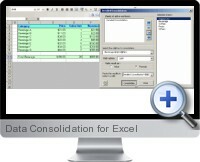 The process of data consolidation can also be automated. Detailed Consolidation - This type of consolidation is appropriate to see the detail along with the consolidation totals. Export sheets - This tools allows the exporting of chosen sheets from a workbook with options such as converting formulas to values, keeping colors, and ordering. Toggle settings - This tool saves time by saving settings that can be recuperated and utilized for repetitive tasks. Freeze or Divide panes - This tool can help in the process of creating, navigating through, editing excessively long models and keeping an eye on them.